Hungarian Prime Minister Viktor Orbán congratulated on the team’s successes in his letter to our team leader, András Gschwindt on 8 March 2012. As our readers might recall, March 8 also happens to be the day when Masat-1 made its first space photos of the Earth. 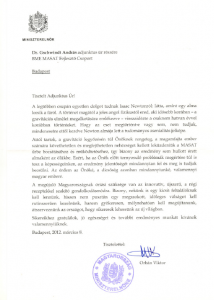 Therefore, this day has an even greater significance in the history of Masat-1 and probably the whole Hungarian space research segment. A quote from the letter: ‘The achievement of the team is an honor to all Hungarians’. 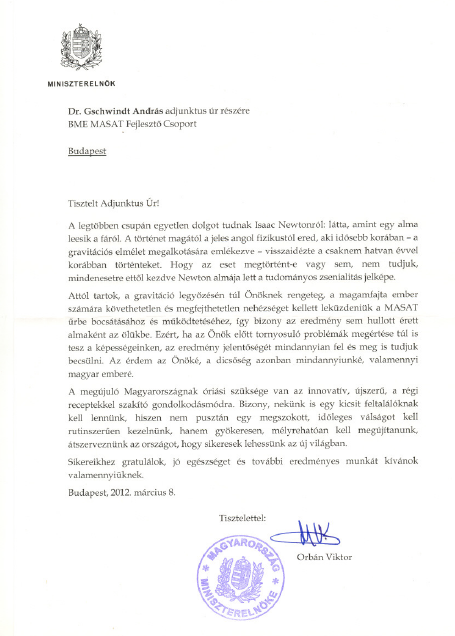 András Gschwindt has thanked the Prime Minister’s words of acknowledgement in his reply. You can read a copy of the letter here.